Today marks my last day before a glorious two-week stay-cation. This means I won’t be posting for a few weeks, but I couldn’t leave without one last post! My friends and family expect yummy results when I announce I’m baking a cake, and I really hate to disappoint! The last couple years my specialty has been Rose Levy Beranbaum’s chocolate butter cake from one of my favorite books, The Cake Bible. I’ve made the cake for special occasions (see photo of a birthday cake for my mom and below from my 10 year wedding anniversary) and just because I wanted cake! It is a little bit more involved than some other cake recipes, but sooooo worth the effort. It is a denser cake that holds good structure, and packs good chocolate punch without being too fudgy. My goal over my time off is to convert this recipe to a “you would never know it” gluten-free cake. I will gladly share my successes (and hopefully very few disasters!) upon my return. I have included the original recipe below – it was the inspiration for the recipe I made and demo’d with the Swan Cafe’s GF Chocolate Cake mix (which will be a Member Owner Deal next month!). I usually weigh all my ingredients for this cake, but I have included the measure as well. If you make this yourself, use one system or the other for the best results. I have only made this as a layer cake, and don’t recommend using a sheet pan, but what fun is cooking without experimentation, right? All ingredients should be at room temperature, except boiling water. 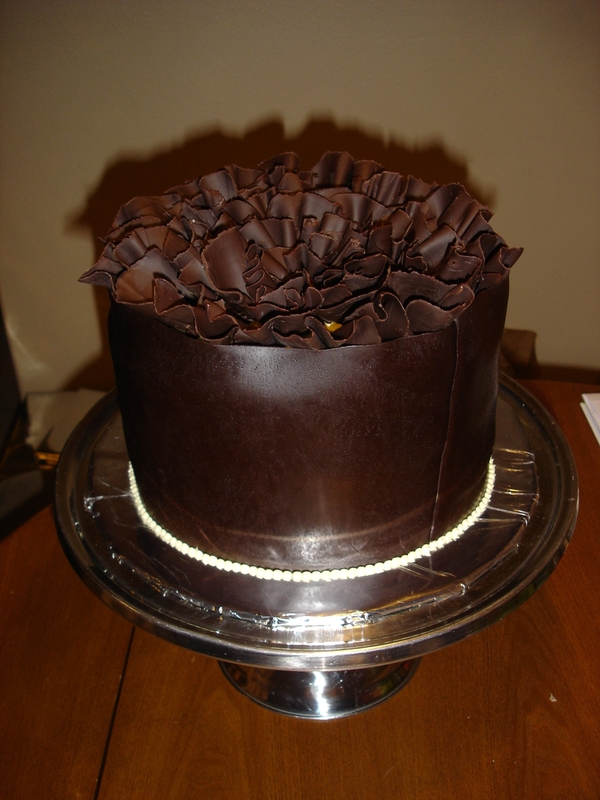 Prepare cake pans : (2) 8″ or 9″ cake pans – grease the pan, line bottom with parchment paper and grease the paper. Flour pans. 2. In a medium bowl, whisk together cocoa and boiling water until smooth. Cool to room temperature. 3. In another bowl, lightly combine eggs, 1/4 of the cocoa mixture and vanilla. 4. In a large mixing bowl, combine the remaining dry ingredients and mix on low-speed for 30 seconds to blend. Add the butter and remaining cocoa mixture. Mix on low-speed until the dry ingredients are moistened. 5. Increase to medium speed (high-speed if using a hand mixer) and beat for 1 1/2 minutes to aerate and develop the cake’s structure. Scrape down the sides. 6. Gradually add the egg mixture in 3 batches, beating for 20 seconds after each addition to incorporate the ingredients and strengthen the structure. Scrape down the sides. 7. Scrape the batter into prepared pans and smooth the surface with a spatula. The pans will be about 1/2 full. 8. Bake 25 – 35 minutes or until a tester inserted near the center comes out clean and the cake springs back when pressed lightly in the center. The cakes should start to shrink from the sides of the pans only after removal from the oven. 9. Let the cakes cool in the pans on wire racks for 10 minutes. Loosen the sides with a small metal spatula and invert onto greased wire racks. To prevent splitting, re-invert so that the tops are up and then cool them completely before wrapping them airtight. Finished cakes will be about 1 1/2″ tall. Store airtight: 2 days room temperature, 5 days refrigerated, 2 months frozen. Texture is most perfectly moist the same day as baking. Have ready a 1 or 2 c greased, heat-proof glass measure near the range. This recipe is easiest with a stand mixer, but you can also use a heavy-duty hand mixer. 1. Place egg yolks in the bowl of your stand mixer and beat until they are light in color (this will take several minutes in a stand mixer, and several more with a hand mixer). 2. Meanwhile, combine sugar and corn syrup in a small saucepan (preferably with a non-stick lining, but my stainless steel one has always worked well for me) and heat, stirring constantly until the sugar dissolves and the syrup comes to a rolling boil (the entire surface will be covered with large bubbles). Immediately transfer the syrup to the glass measure to stop the cooking. 3. If using a hand-held mixer, beat the syrup into the yolks in a steady stream. Don’t allow syrup to fall on the beaters or they will spin it onto the sides of the bowl. If using a stand mixer, pour a small amount of syrup over the yolks with the mixer turned off. Immediately beat at high-speed for 5 seconds. Continue with the remaining syrup. For the last addition, use a rubber scraper to remove the syrup clinging to the glass measure. Continue beating until completely cooled (this will take several minutes – use the time to clean your glass measure and saucepan before it gets too sticky!). 4. Gradually beat in the butter and, if desired, any optional flavoring. Place in an airtight bowl. Bring to room temperature before using. Re-beat to restore texture. Pointers – The syrup must come to a rolling boil or the butter cream will be too thin. Don’t allow the syrup to fall directly onto the stand mixer paddle as it will spin the syrup around the sides of the bowl and create a giant mess. Using a hand mixer for this portion can make this easier. This entry was posted in Uncategorized by Melissa Elkins. Bookmark the permalink. I was strolling through your page and a few items caught my eyes that I had to stop and read all these tasty goodies! You have so many wonderful things on your page. My top favorite is this mouth watering cake! You done a great job on it! Thank you so much! It did taste sooooo good…this is a fantastic recipe (as are all of the Cake Bible recipes that I have tried!). Absolutely the best! Butter cake is my favorite cake flavor of all time. Thank you for sharing this recipe as my wife made this cake a couple of days ago and it turned out perfectly. It went really well with a hot cup of coffee made from my elektra espresso at home. Kudos! 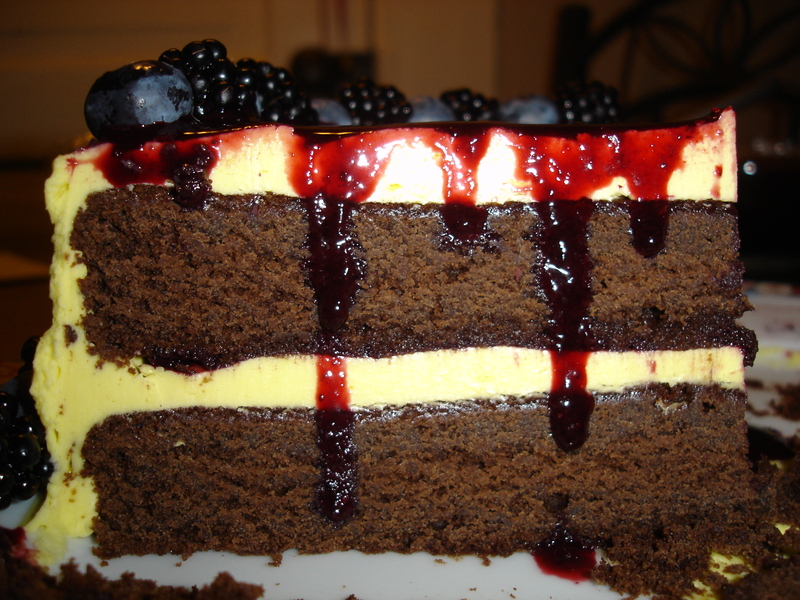 This is one of my all-time favorite cakes…especially with some espresso! Pingback: Episode XXXVIII:A one upper still “in training” and the bunny cake | I Can't...But I Can Cook! How can I add more chocolate to this recipe? If I melt dark chocolate in cream or yogurt, can I add directly without changing anything else? You could try adding a little more (maybe a 1/4c) of cocoa powder to the recipe, but if you are looking for an intenser chocolate flavor than I don’t think this is the best recipe to use. Adding chocolate frosting helps up the chocolate quotient in this recipe overall, but I would recommend this Texas Fudge Cake recipe from our Bakery if you want a delicious and intense chocolate cake that isn’t super dense – http://www.communityfood.coop/coop/wp-content/uploads/2011/07/Texas-Fudge-Cake1.pdf – I’ve even made this with gluten-free flour and it’s pretty fantastic. I don’t see any reason you couldn’t make an 8″ two-tier layer cake with the recipe, you just will have to adjust the cooking time (I’d check it after 20 minutes). It is also kind of delicate because it is so moist, so I would line the pans with parchment and oil them up. Good Luck!